How does summer screen time seem to always take over? You’re not quite sure how it happens. When the first day of summer arrives, everyone is so excited. There are BIG fun plans for the school free days ahead. There will be camps and crafts. Swimming in the pool, picnics in the backyard, trips to the park and family game nights. There’s no way anyone will get bored. The kids will be so busy having fun, they won’t even think about watching TV or playing on the ipad, except maybe for the occasional rainy afternoon. But by the end of that first week, somehow things just aren’t quite turning out like we imagined. You tried that “simple” craft you found on Pinterst with the kids, but after 10 minutes they’ve all abandoned you leaving trails of glitter scattered in all directions. Then the toddler flushes all the little papers from the boredom busters jar down the toilet, of course clogging it up in the process. You emerge from cleaning up that mess only to find the dog with the remains of your summer bucket list hanging out of his mouth. The days start to seem so much longer than you expected and it’s hot outside and no one wants to go to park or have a picnic in the backyard. The whining and the complaining and the “He won’t stop touching meeeeeee.” begins. And BAM! Hours later your darling children have transformed into screen time zombies. Listen, it happens to the best of us. And no, we’re not bad moms if we let a little more screen time slide during the summer than we had planned. But what happens when tech starts to take over? 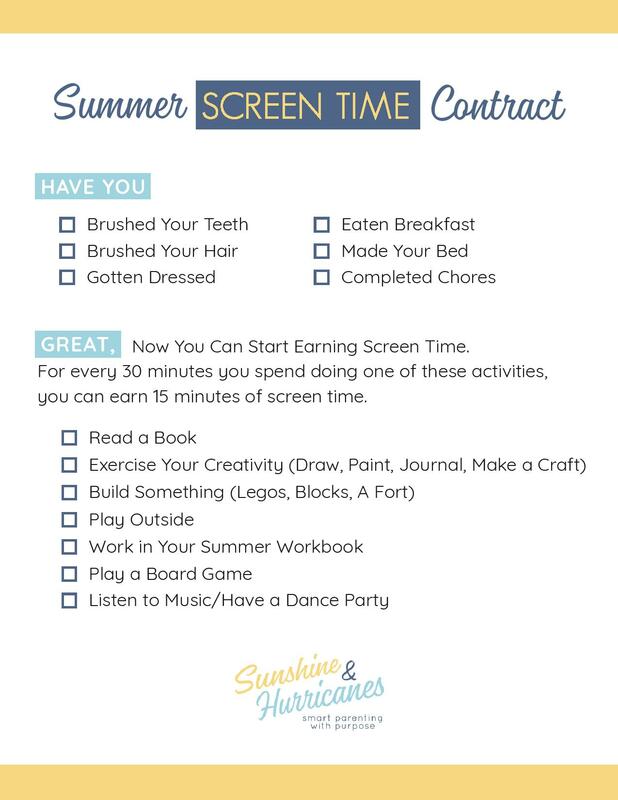 Don’t worry, you’ve got this.You just need a few tips and tricks for managing summer screen time. We know, you really gave it the old girl scout try, but you’re done. You’ve had it. “When does school start again?” you whisper to yourself as you glance over at the calendar. To save your sanity, you offer one television show, a movie, or the iPad. Before you know it, four hours have passed. It’s definitely been quiet so maybe screens aren’t such a bad idea after all. 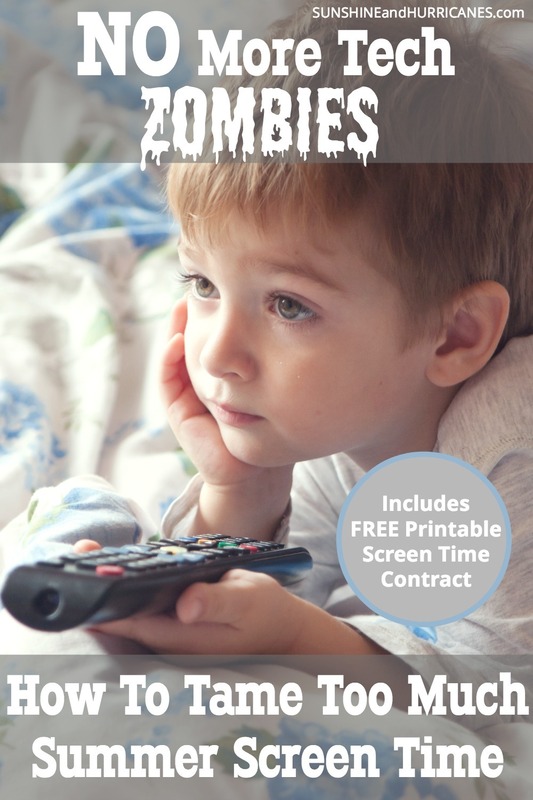 You’re definitely not going to sleep anytime soon, because you’ve now left your comfy bed and you’re Googling like a mad woman searching for ways to undo the damage all that screen time has done to your zombie…I mean kids. Okay, so maybe it’s just me who tries to Google her worries away at 2 a.m. BUT, I’m going out on a limb here and suggesting I might not the ONLY one that has had this happen. We really shouldn’t be losing sleep over this or giving ourselves guilt trips. Technology is NOT our enemy. There are tons of benefits and educational opportunities waiting to be experienced and, like everything in life, moderation is key. During the school year, managing screen time is easier for us. The few hours after school seem to fly by and are usually filled with sports, dance, homework and dinner, leaving little time for electronic endeavors. When Summer arrives, most kids are definitely looking forward to less structured schedules, which in their minds means more screen time. If yours are anything like mine, they start asking for it as soon as they’re awake and don’t stop until bedtime. That’s not annoying or anything (insert serious eye roll here). Since at least some of us would never survive the summer if that continued, I developed a “screen system” over here for managing summer screen time that has made life more peaceful for all of us! Creative Activity: playdough/clay, drawing, coloring, painting, etc. Often times, my kids get so involved in the “If” activity that it will consume far more time than planned, but they may not have started the activity without the future promise of screen time. If there is arguing or complaining, I automatically start reducing the amount of promised screen time, no exceptions. The expectations are clearly outlined from the beginning and if you’re consistent with this, it will work. Believe me when I say, you can survive summer without having it taken over by endless screens. You just need a system and now that you’ve got one, summer can be fun, not stressful. Looking for a few more ideas to offer up instead of screens? Check out these posts! 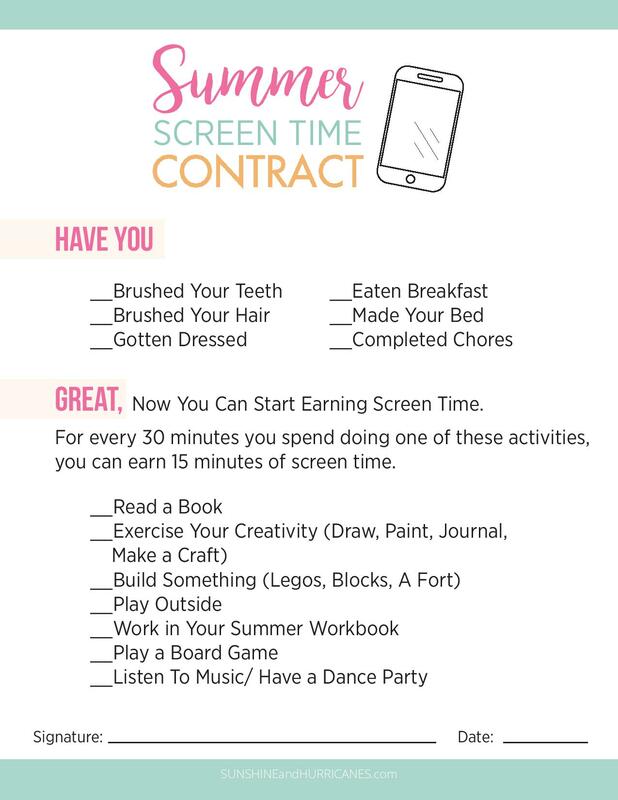 Do you have any tips and tricks for Managing Summer Screen Time? If you want to reduce kid’s screen time, don’t remove the devices. Take away their chargers for how long you feel is neccesary. It’s so easy to get sucked into screen time. I try to set designated times and be aware of it. Plus it’s so beautiful I’d feel bad not going out in summer! This seems to be a universal parental issue at the moment, but to me it is pretty simple as one can pre-set the time one uses a computer and then it times out, not to be used foe the per-set allottment of time! Works like a charm! This is a huge issue in our family right now with my tween. He wants to connect with his friends and FaceTime and texting is the way he does it… however, it becomes a slippery slope. We do the bartering system– do this for X number of minutes too! These are such great tips. Keeping a limit on screen time makes a big difference in son’s behavior so I’m always looking for ways to handle it successfully. Thanks for the ideas! What great tips! It can be so hard to limit screen time when kids are home all day and bored! Love your “if then” strategy and I will have to give that a try with our five year old!! These are great ideas. This is always a battle in my home all summer long! We’ve been doing the if, then system. My older kids have summer pre-AP and AP assignments, so after they read a couple chapters, then they can watch tv or play video games. Sadly, a lot of my friends use technology as babysitters for their kids! It is frustrating to see, especially in the summer months when kids could be out playing outside and learning real-life experiences! Another wonderful post! I need to share this one this week. I love that you said technology doesn’t have to be the babysitter. I think that is so important. So many wonderful things to help parents this summer. I need to limit my own screen time, I think. It definitely takes effort to keep the screen time to a minimum, but it is worth it! I like your take on how technology doesn’t have to be the enemy or the babysitter; it’s important to find a good balance between too much and no tv or internet time for kids during the summer. Pinning!